Tasmania offers some of Australia’s most impressive natural sights all year round, but its landscapes reach stunning new heights in spring. Get ready to feast your senses on the island state’s abounding treasures of the season. As spring sweeps across Tasmania’s impossibly picturesque lavender fields, delicate buds greet the warmer weather. The sea of lavender occupying the horizon will take your breath away and make an absurdly pretty backdrop for an impromptu DIY photo shoot, but this flower is more than just a pretty face. From infused ice-cream, hot chocolate, cheesecake and fudge, sample the treats you know and love with all-new, lavender-flavoured oomph at the state’s various lavender fields’ onsite gourmet eateries. If you’re in and around Hobart, meander south-east to Port Arthur Lavender Farm for your lavender fix or, for those in Tassie’s north, pay a visit to Bridestowe Lavender Estate, just a 45-minute drive north of Launceston. Make sure you plan your lavender fields visit for the tail end of spring, when the warmth has coaxed the mauve blossoms into full flower, just before summer’s peak tourist period. Also in the Launceston area, Wychwood Garden and Nursery is another oasis of fabulous, world-class gardening that comes to life in October. This lovingly manicured acreage features rare flower and tree species, and twisty paths and curly hedges fit for an enchanted garden. Hobart’s stately botanical gardens first opened its gates in 1818. Today, it’s celebrating its bicentennial in style, with the customary floral splendour that arrives with each spring and a commemorative gin, locally crafted with onsite botanicals. 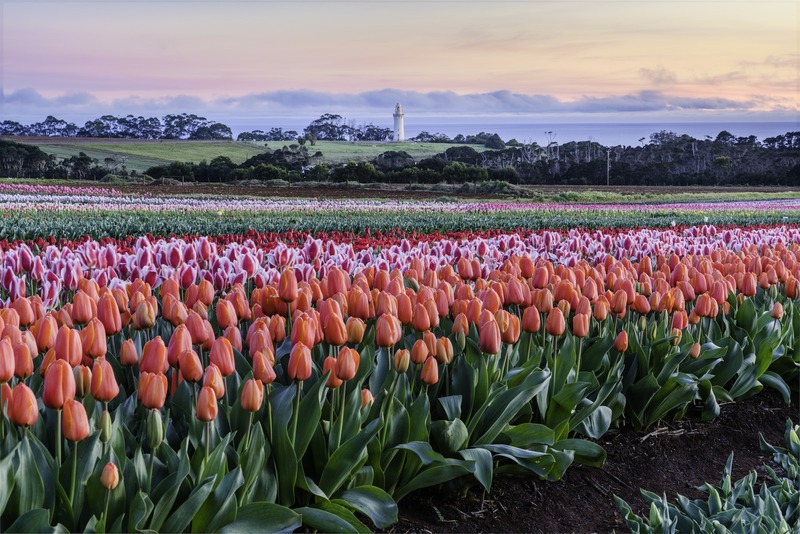 In Tassie, spring wouldn’t be spring without elegant tulips to usher in longer days and warmer nights. At the turn of September, painstakingly tended tulips steal the show and splash long-anticipated colour across the garden grounds. After an afternoon strolling through the spellbinding gardens, treat your tastebuds to a meal at Succulent, the restaurant attached to the visitor centre. This delightful eatery may have been named after flora, but we can vouch that the culinary connotations of Succulent are not at all misleading! Enjoy your meal from the restaurant’s verandah, perched on a grassy hill overlooking sparkling coast, and the gardens’ meticulously groomed greenery and tulip-bedecked flowerbeds.